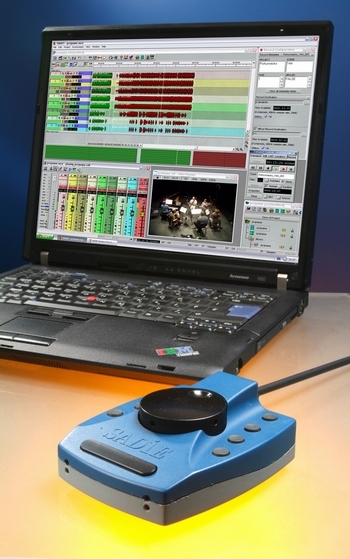 The SADiE PCM2 is non-destructive hardware audio editing system complete with SADiE Version 5 software. It provides the ability to edit audio professionally wherever you can take a laptop running Windows XP. The PCM2 comes complete with both the small hardware unit (pictured) that contains the system's processing, together with the latest Version 5 SADiE recording/editing/mixing software. The unit itself connects to a standard PC/laptop running Windows XP via a standard USB 2.0 connector. It contains the stereo analogue inputs and outputs on standard RCA/phono jacks (so you can hook it up to a standard hi-fi), and these can be switched to digital inputs (S/PDIF) and outputs as required. It also has a stereo mini-jack headphone output and mic input. For editing, the interface has a beautifully weighted jog-wheel and 9 dedicated edit buttons to speed up frequently used editing tasks, as well as virtually every single function assignable to a user-programmable hot-key on the keyboard. All the standard features of the full SADiE software are supported up to 8 Playlist streams, which can be upgraded to a maximum of 24. As with the other SADiE 5 systems, there is the same high-level of editing with five editing methods (Playlist, Trim, Speech, Region and 3 & 4 point) for a combination of speed and accuracy, including highly advanced cross-fade editing. There is an extremely powerful software mixer, which can be externally controlled from a variety of common controllers (from SSL to Mackie HUI/Control), with full automation and many included plugins (EQ, dynamics, aux sends, etc). Direct-X is supported along with optional VST support. Automation can be seen directly in SADiE's Playlist Clips and is moved around with them as you edit the audio further. The automation can be controlled via the software (or hardware controlled) faders or by directly manipulating the automation on the clips themselves, for each function (level, pan, EQ, etc). There is the same comprehensive project management system as with the larger SADiE systems, including the import/export of components (mixers, EDLs, Clipstores) from other projects and indeed other manufacturers' systems. An all-inclusive import/export engine allows for files to be copied or referenced, automatically sample-rate converted and locked to a project for backup, management and archive purposes. Of course all projects created on PCM2 can be immediately opened in the larger studio SADiE systems and vice versa (subject to track count) for a home-working workflow. SADiE can play Broadcast WAV (by default), WAV, AIFF, SDII files all in the same Playlist with no conversion necessary, and can import/export MP2 and MP3 files with a dedicated SADiE plug-in. Most of the optional SADiE software packages are supported in PCM2, including VST, CD Text, MP3 import/export, Mastering, Video, CEDAR restoration (De-Click, De-Noise, De-Thump, De-Crackle, Retouch) and a host of other plug-ins from SADiE including Graphical EQ and Mastering Limiter.